Welcome back to another Fido Feature! We hope you enjoy getting to know our pack just that little bit better! We would like to introduce the very loveable Labrador Millie. Millie is a seasoned daytripper and has been part of the Houndog squad for a few years. With a big love for toys and balls, you will always find her running after a ball with the boys in tow. 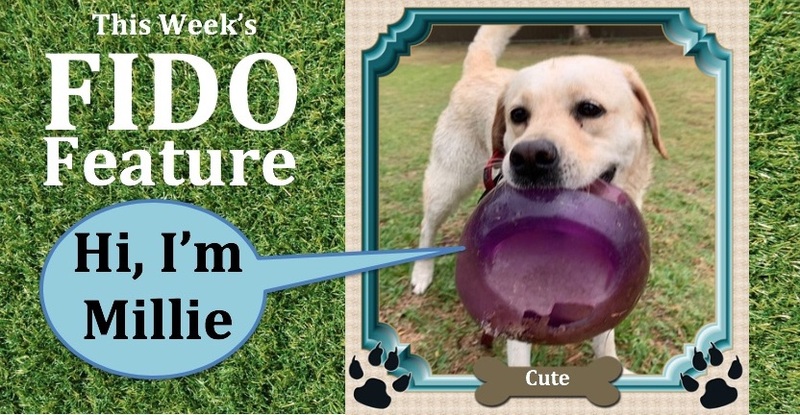 A typical Labrador (like Millie) is an exuberant, very energetic breed that needs lots of exercise every day. A lab who doesn’t get enough exercise is likely to engage in hyperactive and/or destructive behavior to release pent-up energy. Labradors make great family pets and need resistant dog toys. The roots of this breed come from the Newfoundland line which is famous for their ability in the water. We love seeing all the breeds being exercised each week, particularly the Labs as their favorite activities include retrieving and swimming. You will find Millie very active in the park and she is also a skilled swimmer at the beach. Like most labs, her thick, tapering tail is known as an Otter Tail. This tail serves as a powerful rudder, constantly moving back and forth as the dog swims and aids the dog when turning. Milly is a very adaptable, intelligent, outgoing and playful dog. She loves her treats on pick up and drop off. It is always a pleasure having Millie join us on the daytrips as her high energy definitely lifts the pack (in and out the water). Can’t wait to see you at our next daytrip ! All of our dogs are such loveable characters! Have a suggestion for who we should feature next? Let us know in a comment on facebook!